A friend recently sent me a link to the Jellywares on Marshall Spring Yarn Club. What a great way to try out different yarns, such a wide range available these days making it hard to choose. Also, this way you get to complete a small project only needing one ball of yarn with the bonus of finding out if you like working with that yarn. There was a choice between knitting and crochet and while I am starting to master crochet, I still prefer and find knitting more relaxing. Jodie has done an amazing job sourcing different yarns and suggesting patterns to make it up in. September was month 1 of the 3 month club and our parcel arrived with a ball of Noro yarn and a cute project bag to pop our knitting in. The welcome letter included some suggested projects which were from Ravelry, and whilst I had heard much and seen many blog posts about Raverly (knitting/crochet site) I was still a novice exploring it. I signed up and had a quick look but it took me awhile to get under way and whilst I liked the suggested options, none quite 'sang' out to me to make them. It wasn't till our October package arrived (I know, rather slack but wanted to wait till I found the perfect option for me and to be very truthful was overwhelmed on my first visit to the site, it has soooooooooo much information and so many project options) that I began my September project. So back I went back to the Ravelry site and spent more time exploring to find the ideal project. I knew I wanted to make a scarf, the colours are just perfect for the friend whose name came to mind as soon as I saw the yarn. The Noro yarn is a mix of cotton, silk, wool & polyanide, easy to work with, changing colours and texture throughout the ball. 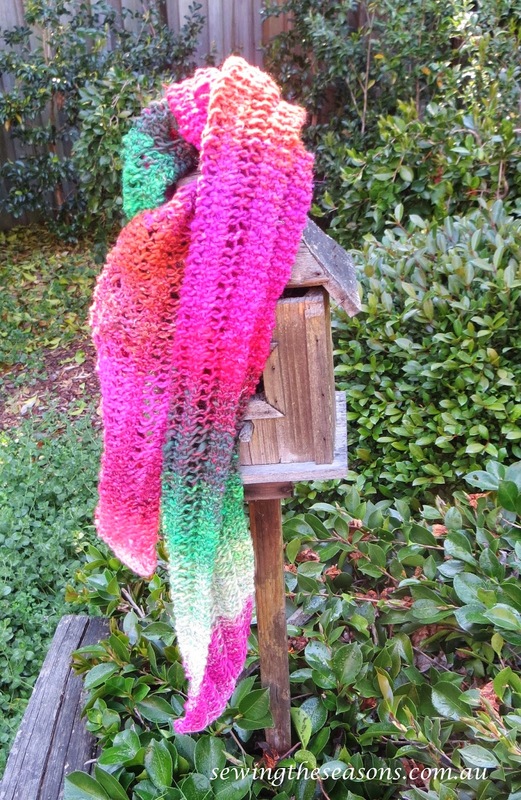 I chose to make the one Row Lace Scarf following the suggested needle size and variation of number of cast on stitches from this lady's variation using the Noro yarn. Once I had the pattern, I started that night. Part way through the next day. I loved watching how the yarn changed from one colour to the next, not just stop/start like some yarns but a gradual blending of the colours. And here it is, the finished scarf, finished length approximately 160 cm, ideal for wrapping up snug and warm on chilly winter days. Stay tuned for the October, month 2 projects.